Whew! I have finally finished my series of “old” photos from my early days and readers must surely be glad. :-). I made a recent trip to another new place for me, but with the still, very familiar feel of New England: Newport, Rhode Island. But before I comment on that, it seems like a good time to reflect back on the prior recent blogs. I stopped at 2008 with my “old” images which dated back to the 1970s. There is no right time to differentiate “old” from “new.” But 2008 marks the year I started blogging here. But I am not wired that way, and my blog continues to be more of a combination of a diary and travelog. I don’t seem me changing that any time soon. I will probably continue to follow my errant ways. Because I can :-). I was surprised, when I looked back, to note that my very first blog in March of 2008 did not contain a single image! Kind of strange, for a photo blog. I have tried to remedy that in the ensuing years, posting images in the majority of my blogs. The Purple Coneflower image is one of my first digital capture images and was posted here in my earliest blogs. The next blog, and first substantive blog addressed my view of “photorealism.” Namely that is is what my eye sees, without regard to what others may think is “purist” photography. On my recent trip to Newport, Rhode Island, we photographed the Point Judith Lighthouse in Narraganset. We met a guy who had spend several evenings trying to catch the moonrise in the “right” place over the light. It wasn’t cooperating with him, but he was patient. I am not. I only had 3 days in the area. So I moved the moon in my image :-). You can see that I need some help with getting content aware move right (I have a fringe from the the sky color where I moved it from). I am sure I will figure out how to do that. I am not Walter Cronkite (and even he indulged in fakery, by the way), and don’t really care where the moon was. I am about creating a nice image. The Bingham Falls image is another one from my earliest blogs here. About the time I started blogging, I had two friends who expressed a desire to “graduate” from point and shoot snapshots to more serious photography. They inspired me to write some long tomes intended to try to simplify some of the fundamental photographic principles. These writings eventually were translated to some of my “tutorial” style blogs. 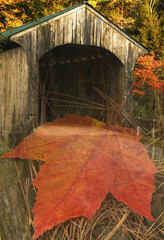 I am glad to say that one of these persons, Carol Smith, has become a very talented photographer and has agreed to co-write the next edition of my Photographing Vermont’s Fall Foliage e-Book this winter. As I began to do more and more traveling, this blog has gradually morphed into more of a travel diary, starting with my week long trip to Acadia National Park in 2009 and then Alaska in 2010. Though finding fresh subject matter is often a challenge, I plan to keep writing here and I am very much appreciative of those regular readers and commenters on the blog. See you next time with some images from Newport, Rhode Island.